Health Minister Mohammed Nasim called upon BNP to accept results of Gazipur City Corporation (GCC) polls and make analysis of their political lacks instead of making widespread allegation of vote rigging. He also asked BNP leaders to do public friendly politics and nominate good candidates in order to win any polls. The minister was addressing a seminar titled “Election and Level Playing Field” organised by Bangladesh Heritage Foundation at CIRDAP auditorium in the capital on Wednesday. Rejecting BNP leaders’ allegations of election engineering behind Awami League mayoral candidate’s victory in Gazipur city polls, he said opposition leaders are habituated to make such blame instead of finding their own faults. “The upcoming national election will be held according to the constitution on the right time. Messi, Ronaldo may miss penalty but Sheikh Hasina won’t miss penalty,” Nasim said and asked BNP leaders to be prepared to contest the polls. Prime Minister’s Media Adviser Iqbal Sobhan Chowdhury, Trinomul BNP’s chairman and former BNP leader Nazmul Huda, Bangladesh Communist Party backed MP Shirin Akhter also spoke at the seminar. Waliur Rahman, Chairman of Heritage Foundation, gave introductory speech. 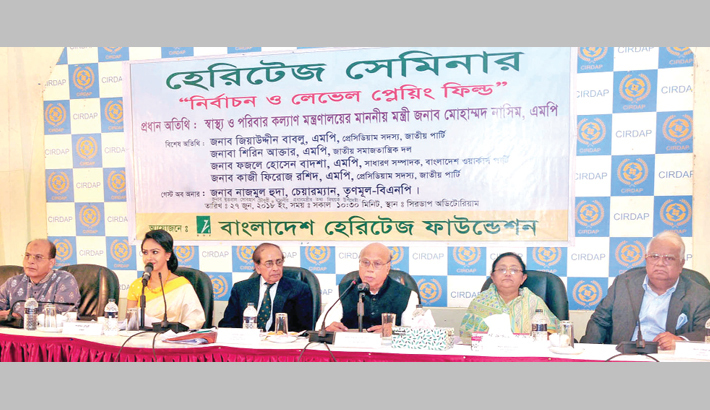 Former Dhaka University Vice-Chancellor (VC) Prof Dr AAMS Arefin Siddique, World University VC Prof Abdul Mannan, Amader Orthoneeti Editor Naimul Islam Khan and a large number of academics, journalists and civil society members attended the seminar, among others.